Surfers at a competition in New South Wales were in for a surprise when they found themselves in the company of a large spinner shark. 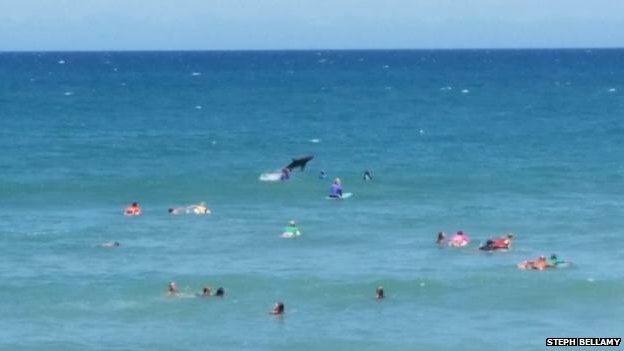 Spectators saw the shark leaping in and out of the water near Coffs Harbour, close to the surfers and swimmers. The moment was caught on camera by local resident Steph Bellamy, who said the shark “photobombed” her picture..
Two species of lizard previously unknown to science have been uncovered in a remote part of far north Queensland. Dr Conrad Hoskin, a researcher at James Cook university, found the two species after landing by helicopter in a largely inaccessible area of rainforest on top of the Melville range, about 170km north of Cooktown. 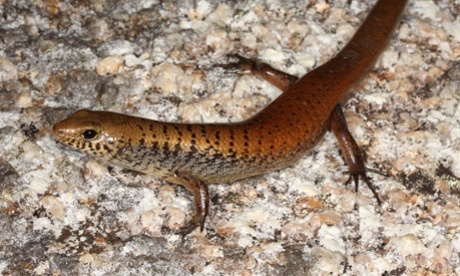 The species have been named as the Cape Melville rainbow skink and the Cape Melville bar-lipped skink. 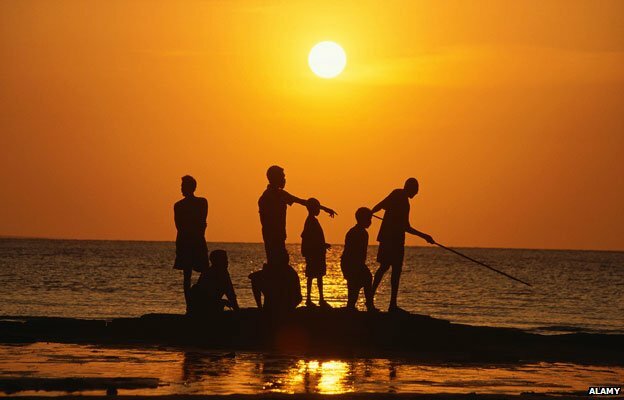 The scientific names of the species – Carlia wundalthini and Glaphyromorphus othelarrni – were chosen by local Aboriginal leaders in a nod to previous traditional owners of the land. Hoskin said the discoveries were “very exciting” and added to three other species he uncovered during a series of trips to Cape Melville last year: a leaf-tailed gecko, a boulder frog and a golden lizard. “In each of those cases, as soon as I saw them I knew they were new species,” he told Guardian Australia. 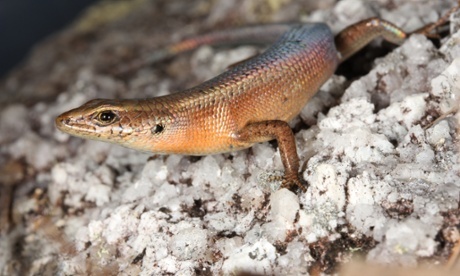 The rainbow skink is only about 10cm long, with shimmering scales. It is very fast and active during the day, eating small insects. Meanwhile, the bar-lipped skink is slightly larger, about 20cm long, and lives a more subdued life, emerging mostly at dusk. Hoskin’s discovery of five new species in total adds to a further three species found at Cape Melville in the past few decades. The entire global populations of these eight endemic species live within the rainforest plateau and lowland area of Cape Melville. Quite a contrast to the British. 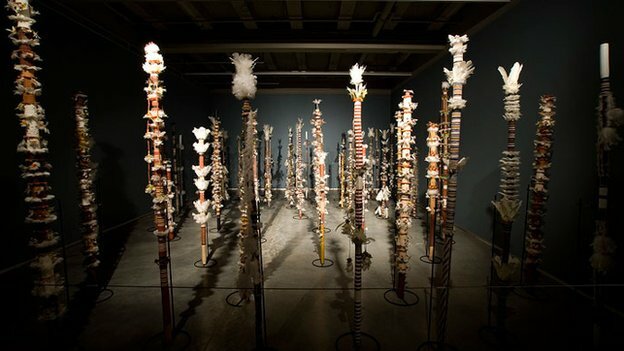 Britain designated the country terra nullius – land belonging to no-one – and therefore colonised the country without a treaty or any recognition of the rights of indigenous people to their land. 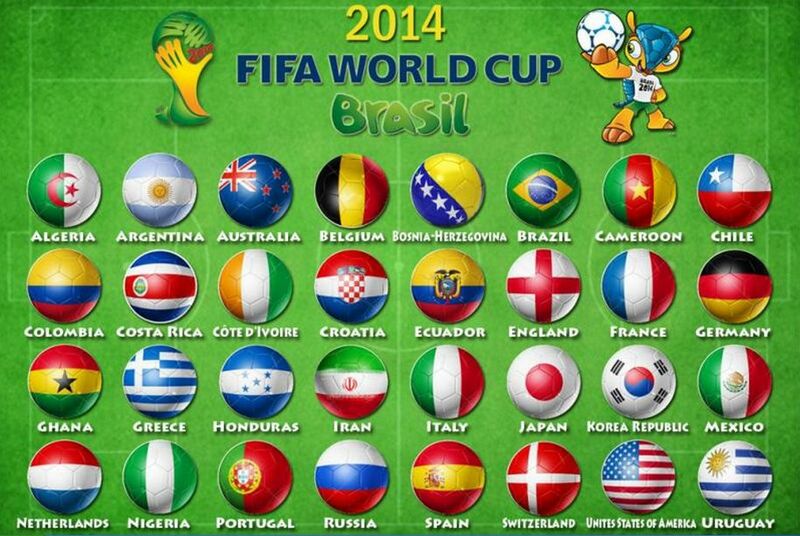 New Zealand, or Australia is playing? Is this how the marsupial lion killed prey? I’ve been thinking – as one does – about marsupial lions. Of all the species that became extinct after people first arrived in Australia, between 40 and 50,000 years ago, this is the one that intrigues me most. Even more, that is, than the spiny anteater the size of a pig; a relative of the wombat the size of a rhinoceros; a marsupial tapir as big as a horse; a ten-foot kangaroo; a horned tortoise eight feet long and a monitor lizard bigger than the Nile crocodile. 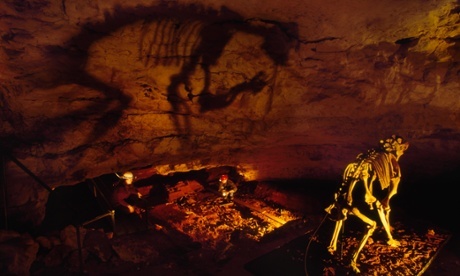 The lost Australian megafauna looks like a science fiction film directed by an acid casualty. But it’s the marsupial lion (which was unrelated to the placental lions that remain alive today) that intrigues me most. It was big but, by Pleistocene standards, not huge: probably halfway between a leopard and an African lion. Morphologically, in some respects it more closely resembles the bipedal carnivorous dinosaurs than any mammalian predator. It could walk and run on four legs, but it also seems to have possessed the ability to stand, with great stability, on two. We know this because, like the kangaroos and some of the heavier dinosaurs, it had chevron bones in its tail. These turned the tail into a stout prop, the third arm of a tripod when the animal stood up. But unlike, say, tyrannosaurs and velociraptors, marsupial lion species (the biggest of which was Thylacoleo carnifex) also possessed enormous, highly muscled forelimbs. These were equipped with vast hooked claws. It seems to have been the only marsupial with the ability to retract its claws, which allows them to remain sharp. 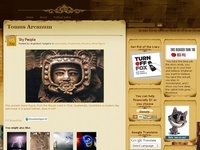 (Think of the difference between a cat’s claw and a dog’s, which is blunted as it scrapes on the ground). It had an extraordinary dentition – huge fused teeth like knife blades – and, the musculature suggests, the strongest bite for its size of any known mammal. All this we know from the fossil bones. There’s also a suggestion that it was striped. 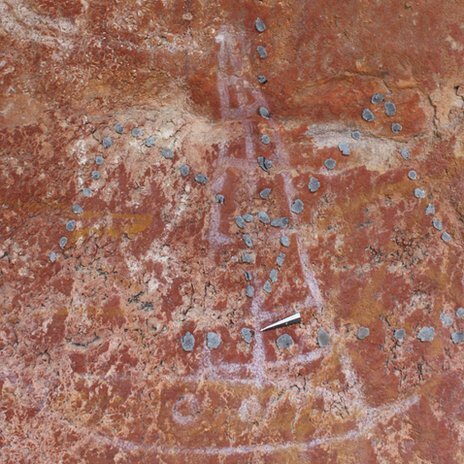 That, at least, is what the one ghostly image of this beast in an ancient rock painting, discovered in 2008, suggests. Adaptations like this don’t happened by accident. This was a specialised predator, which seems to have been equipped for a strategy unlike that of any carnivore alive today. But what was the strategy? There are, I admit, more pressing matters. But once I started thinking about this, it was not easy to stop. So I spent a few hours in an academic library, reading all the available papers on Thylacoleo carnifex. The first thing I noticed was how few there are. While the dinosaurs have been studied from every imaginable angle, and their habits and strategies endlessly debated, the extinct giant mammals (which, being much more recent, tend to be better represented in the fossil record) have been, by comparison, neglected. For example, a couple of years ago I spent three days in the library looking for papers which mention the ecological legacy of elephants in Europe. The legacy looks pretty obvious to me. Trees which can coppice and hedge, understorey trees (box, yew, holly) which – though they carry less weight and are subject to lower shear forces from the wind – are stronger and tougher than the big canopy trees. The black and white reticulations of birch bark look as if they might have evolved to confuse a bark-stripping beast with limited colour vision. But though our forests were recently inhabited by a creature so monstrous that it made the African elephant look like a ballet dancer (the straight-tusked elephant, Elephas antiquus) all I could find was a throwaway sentence in one scientific paper. Look up trees and elephants in Africa, by contrast, and you’ll encounter a large and interesting literature on their co-evolution. There was once a lively academic discussion about marsupial lions, but it stopped at the end of the 19th century, long before modern analytical methods were available. More recently, a couple of sources have proposed that this beast might have been arboreal (living and hunting in trees). But an analysis of its scapula suggests “walking and trotting, rather than climbing … the pelvis similarly agrees with that of ambulators and cursors [walkers and runners]”. These bones indicate that Thylacoleo was a slow- to medium-paced runner, which is likely to mean it was an ambush predator. That fits with the stripes: camouflage of the kind you need for stalking and hiding in a largely forested habitat (like tigers) rather than chasing across open spaces (like lions). But that still doesn’t get us very far. Sure, tigers have big forearms, but nothing (in comparison to their hindquarters) like those of Thylacoleo. Or such remarkable claws or – formidable as they are – such a terrifying bite. And they are top-heavy and unable to stand on their hindlegs for long. The marsupial lion did something that no living predator did, and nowhere in the papers I’ve read is a full explanation attempted. I found one study, published in 1985, which takes us halfway there. It notes that the bones of the marsupial lion are most frequently associated with two genera of kangaroos, Macropus and Sthenurus, including giant kangaroos. 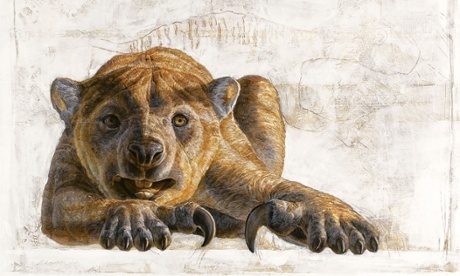 The bones of extinct giant kangaroos bearing marsupial lion toothmarks, found in the Lancefield Swamp in Victoria, suggest that, like the sabretooth cats of the northern hemisphere, it fed largely on the internal organs of its prey. But all this tells us is that kangaroos featured in its diet. I believe we might be able to go further, and speculate that Thylacoleo carnifex was a highly specialised kangaroo hunter. The incident at Lake Moondarra, near Mount Isa, was captured on camera by local residents on Sunday. 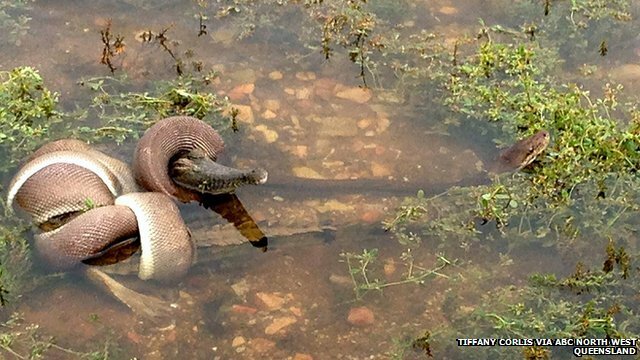 The 10-ft snake, thought to be a python, coiled itself around the crocodile and the two struggled in the water. Two-year-old Kahlei from Victoria, Australia, displays his skateboarding skills on the streets near his home. Kahlei, who has been skateboarding since he was six months old.